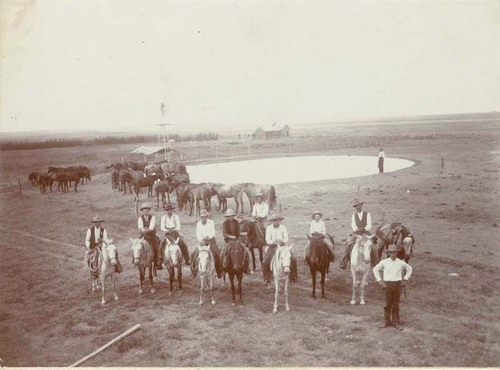 Each spring from 1866 to 1885 cowboys drove longhorns from the Texas ranges to rail heads in Kansas or farther north. It took about a dozen cowboys to drive 2,000 head of cattle. Herd size ranged from around 1,000 head in the early years to 3,000 or 4,000 later on. For their labors, cowboys earned between $25 and $40 a month, plus their food. Most cowboys were young men, in their late teens or early 20s, and single. One 19th-century definition of a "cowboy" was "anybody with guts and a horse." They needed to be strong to survive the harsh conditions of trail life. Cattle stampedes, hazardous trail conditions, and long hours in the saddle in all types of weather resulted in accidents and illness among cowhands. Some did not recover. The common remedy for all ailments was liquor or a patent medicine, most of which had a very high alcohol content. After completing the grueling 300- to 350-mile trip from Texas, members of the crew were free to take advantage of town activities. Saloon keepers, gamblers, and "sporting women" were always waiting at the end of the trail to take their hard-earned money. Although the long cattle drives came to an end in the mid-1880s, there was still plenty of work for the cowboy. Ranching activities in Kansas actually increased. By the 1890s Kansas was ranked third in the nation in cattle production, a position the state retained for many decades. To identify ownership of the cattle, every rancher had his own unique brand. A branding iron was heated in a fire and the owner's mark was burned into the hide of the animal. On the trail, every cowboy would have from five to 10 horses. Sometimes owned by the ranch, his string of horses was ridden on a rotating basis to allow the others to rest and eat grass along the way. Bedrolls were carried in the chuck wagon and not on the back of the saddle as depicted in television westerns. Bedrolls consisted of a tarp about 17 feet long by 6 feet wide and a quilt or blanket. In this bundle the cowboy stored his money, gun, clothing, and any other personal items. The trail boss was the highest paid member of the crew. He was responsible for managing the cowboys, staying on schedule, keeping track of the budget, and seeing that the crew and animals were fed and watered. The cook was the second highest paid member of the outfit. A good cook would attract the best cowboys; he not only prepared meals, but also dispensed medicine and carried the bedrolls. His standard menu of beans and rice was supplemented with canned goods in later years. The legend of the cowboy often omits the many African Americans, Mexican Americans, and immigrants who worked the trails and ranches of the West. Cowboys sometimes formed bands; the Dodge City Cowboy Band, organized in the early 1880s, capitalized on the image of the town. They performed locally, in St. Louis, Chicago, Denver, and at the inauguration of President Benjamin Harrison in Washington. Rodeos developed in the 1880s from the skills cowboys used in their daily routine. Informal demonstrations of bronc riding, calf roping, and steer wrestling held after the semi-annual round-up grew into popular and public contests held nationwide. Wild West shows became an internationally popular form of entertainment.